Successful customer experience companies listen to their customers. They work to ingrain the voice of the customer throughout the organization. They know that, be it a complaint or suggestion, it is a wonderful customer indeed who invests their own time to improve your organization. You’ll want to grow your staff’s appreciation of all customer feedback. Think of every comment that you receive as a present! After all, this is priceless information. Integrate all data across all channels. Combine data to get a holistic view of customer feedback from multiple sources,in order to understand the full impact on your brand. Identify what you want to know. This will help you develop your research methods and collection strategies based on your desired outcome. Focus on your target group. Concentrate your beginning efforts on the customers that matter most to your business and will provide you the highest return on your investment. Watch for trends. As you collect structured and unstructured feedback, look for ways to organize both that allow you to cross compare and uncover trends. This will help you prioritize your efforts. Utilize live feedback methods. Employ an online monitoring system that allows you to be alerted during failed transactions. For example, a customer aborts a process and a support representatives immediately reaches out to the customer to learn and help with the problem. Distribute good and bad feedback internally. Make sure that all of your employees know what your customers are saying, not just one or two departments or stakeholders. The best customer experience improvements will come from all employees actively listening and the resulting operational teamwork across your organization. Host feedback sessions. Hold workshops to discuss the latest feedback. Gather employees into teams and task them to brainstorm improvement ideas. Be sure to include the good feedback too – this provides insight into what customers like. Employ a personal follow-up program. Close the loop with customers whenever possible. Ask their perspectives on the issues. Let them know that you’re committed to partnering with them to resolve problems they’re experiencing. Engage customers in real conversations. Don’t “marketize” your conversation – keep it real and honest. Say you’re sorry when appropriate and mean it. 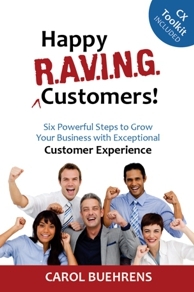 Then show customers you are willing to do something to rectify the situation – and fix it. Assign “Client Insight Managers”. When negative feedback is collected, assign an employee to the customer, so there is one point of contact. Give them the authority to focus on and correct the problem. This individual acts as the liaison for the customer and follows the case to a successful completion. Allow them to go “above and beyond” whenever possible. In my new book, Happy R.A.V.I.N.G. Customers!, “Chapter 8. G = Get Feedback” focuses on ideas and strategies to incorporate listening techniques, management of customer feedback, and techniques to empower employees to take action.